It’s been some time since I’ve come out with a blog. 2013 has certainly been a busy one for me, but one filled with an enormous about of blessings. From travels, to seminars, to new work opportunities, I cannot share enough of how grateful I am for this year, and look forward with open arms and an open heart to even more blessings coming in. One thing that I am not wanting to welcome in is more weight gain, and since early May I have committed myself, with all seriousness to finally changing the shape and health of my body. First of all, I went semi-vegetarian for fifteen days, and then I plunged into Stanley Burrough’s Master Cleanse for ten days. Some of you may know this as the “lemonade diet” or the diet Beyonce went on to get fit and trim for the movie Dreamgirls. Suffice to say, I lost around 11 lbs in those intense 10 days and that gave me the confidence to continue shedding more of my excess weights. My former beauty editor in my former magazine job, Erica Paredes, recommended I try the Chrono Geno Nutrition diet from Belle Today (www.belletoday.com.ph). The diet was to be customized based on one’s blood type, activity level, food tolerance (if any) as well as eating lifestyle. I decided to give it a go and after the election holiday I decided to start. The website with personalized coaching as well as diet suggestions and plans. I spoke to my personal dietician Charmaine who interviewed me on what my eating habits were. Mine are not great, only because I’m always on the move and find myself eating out more than eating at home. Plus, I don’t have the talent for cooking, so that is an even greater challenge as I normally eat what’s put in front of me when I dine at home. My activity level was good, as I do yoga 3-4x a week, walk 5k almost everyday and have started doing a crossfit type aerobic and weight resistance program called HEAT 1x a week. Still, I was told, being a type O, there were certain foods that were considered favorable (can eat with frequency), neutral (foods that don’t give too many benefits) and unfavorable (foods that should NOT be eaten more than twice a week.) I was asked to commit for three months, although with only about 10lbs to shed, I was assured I could probably take that off and keep it off after one month of commitment. I was also given several online tools; to journal my weight loss, inch loss, see what meals I would eat for phase 1-4 as well as a shopping list of what to buy for the week ahead. There was also a daily video and a weekly call promised to keep me encouraged enough to go on as well as track my progress. The pros and cons of knowing your blood type and seeing which foods to eat is to show how much genetics plays into our weight loss. Dr. Chauchard, a french doctor who came up with this program says ” “We eat and lose weight based on our genes.” Sadly, mine was quite intolerant to starch (rice, pasta, breads, desserts-which I love) as well as most dairy, but it did allow me a good amount of protein such as beef, lamb and seafood, with of course, lots of greens and fiber. Healthy balance of protein, greens and fibers is key for my blood type. There was of course, some resistance from me when I was first given my meal plan. Certain foods that I don’t look forward to such as oat bran (for fiber) and chicken ( I prefer red meats) but I was told that I could switch the chicken with seafood or lean beef, as for the oat bran-well, that was a non-negotiable, as it would help regulate (for lack of a better term) the way I would process and eliminate what I ate. Also, there was the “Chauchard tea” that I was supposed to take three times a day that would help in reducing bloating as well as help my metabolism. The meal plan, although not as appetizing as a restaurant menu guaranteed I wouldn’t feel deprived the whole day. Oh, and because Chauchard is french, the continuing phases allowed for chocolates, cheeses and even wine. Thank goodness. The first two weeks though had me munching on dark chocolate and almonds for a snack, and dairy wise I was only allowed low-fat soy milk and yogurt. The meal plan includes recipes, for certain foods that you may not normally serve at home such as a quiche-like egg dish for breakfast. What I enjoyed about having so much personal attention from my dietician is that I didn’t have to sacrifice my social life, I would tell her where I was going for lunch or dinner, if she could pull up the restaurant’s menu she could advise me on what to order that would still be acceptable for my program. Genius. Thank goodness for the internet as most restaurants do have their menu (or part of it) available for viewing online. Needless to say, there were days when I cheated a bit, having a little starch here and there, but I would always be honest and write this all down on my online weight loss journal. At the end of the first week, Charmaine would make a comment about what I did that was “ok” for my diet, and what I could have chosen instead of what I did on days that I veered off my program. Nothing negative, just giving me (for example) why I should have chosen a certain fruit instead of what I ate due to its glycemic index, thereby slowing down my progress. Salad ways: Changing up when eating out. 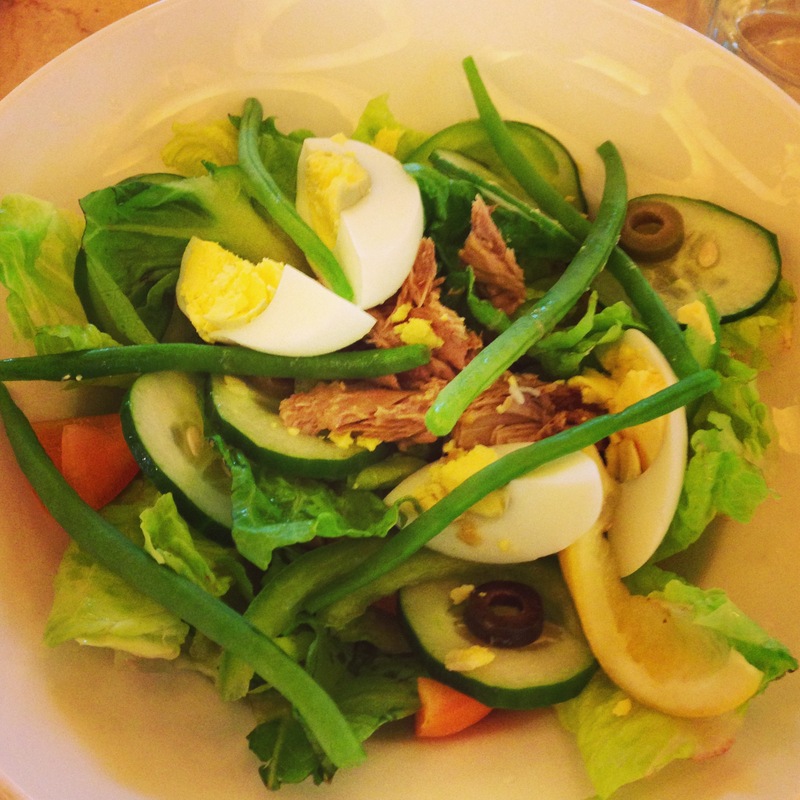 My salad nicoise sans potatoes and the dressing. 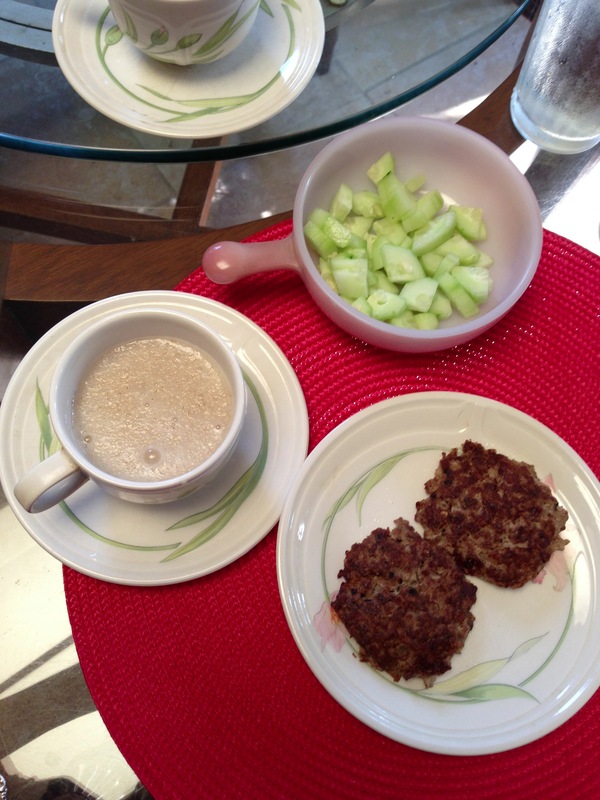 Today, I’m on Day 1 of Week 2 of my Chrono-Geno Diet. I have lost about almost 3 lbs plus an inch from my waist, hips, biceps and thighs. Although I do find myself craving still, I also am enjoying the challenging of eating within the parameters of my diet (hopefully I don’t cheat too much this week) plus having someone to talk to about my progress as well as a cool shopping list that makes me feel like I’m on a mission every time I hit the supermarket. Hopefully, by the end of week 2 I will already hit my target weight, and can enter phase 3 and 4 that allows starch and dairy with more eating mindfulness.